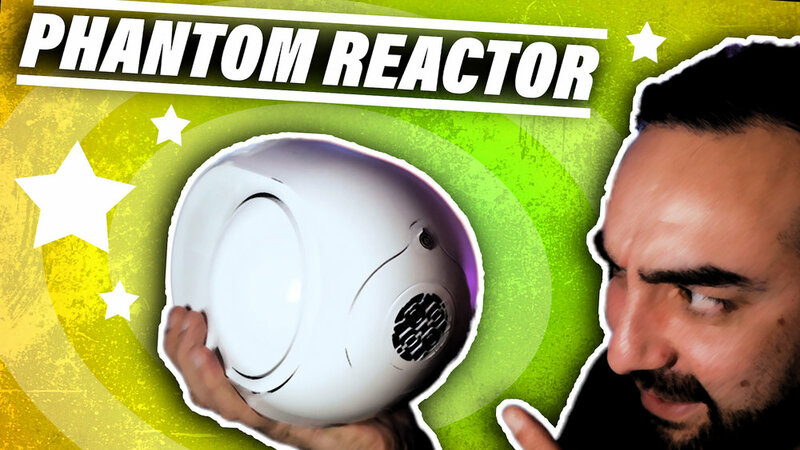 Ok first of let me just say Phantom Reactor...that just might be the most awesome speaker name I ever heard... If you know of a speaker with a better name this let me know. 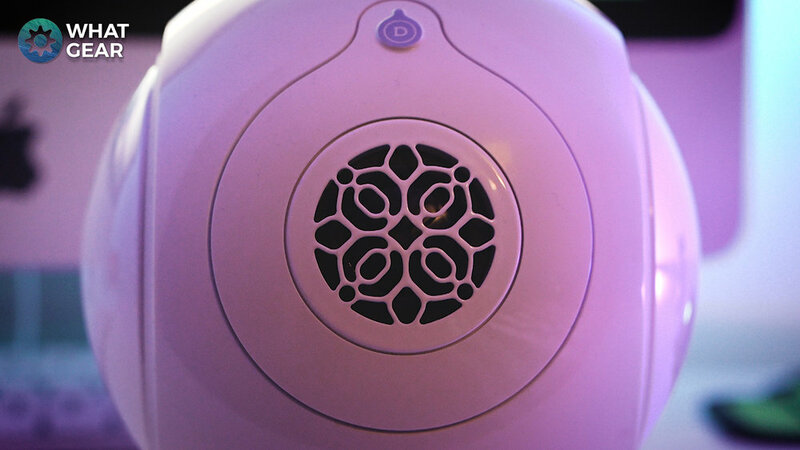 The Devialet Phantom reactor. What a powerful name it has, and trust me it is powerful! You WhatGear legends (YT Subscribers) who have been subscribed to the channel for a while will know... I'm a big fan of Devialet. Now we have this new addition to the formidable French Hi-Fidelity companies Phantom line up. I can't tell you how excited I am about this. You know I was one of the 1st people on YouTube to put a video out on the Phantom. I was as excited then as I am now. Honestly, guys, the Phantom Reactor is going to open your ears & eyes. The Devialet Phantom Reactor is roughly a quarter the size of it's bigger brother the Devialet Gold/Silver Phantom. It's roughly 16 x 17 x 22cm. It is tiny, but it is also no lightweight speaker. The Reactor weighs in at over 4.KG and it's a heavy hitter. Just to get an idea of its size, in the Devialet Phantom Reactor review video, you can see it side by side with a Bose SoundLink mini and my current favorite BT speaker the Sony SRS X7. It is virtually identical to the original Phantom with the white sides, and snowflake grill on the front. Power button and ports as well as heat vents at the back. Of course it has got the iconic aluminum woofer covers on sides. except this time the are 10cm's in diameter. There are a couple of differences here in comparison to the big phantoms. The way the Phantom Reactor has been manufactured is slightly different. It's still a single piece cabinet but now you've got capacitive touch buttons across the top. The original phantoms had a mid driver and a seperate tweeter. Whereas the phantom Reactor has single 3cm aluminum midrange/treble driver. This is due to reduction in size of the speaker. Just so you know there are 160 patents and 981 part on this thing. So when it comes to design the Reactor is certainly unique. Let’s go back to the capacitive touch buttons. Across the top we have got BT pairing, volume down, play/pause, volume up, and a sync button for the app. There's also a LED indicator light to help you with pairing etc. I'm a little disappointed there isn't Deezer integration. Especially being that Deezer is also a French company. Don’t worry I'm sure thats something they could add that later. To get the full Hi-Res audio 24bit 192kHz out of the reactor you're going want to use either airplay, upnp or optical and analog from a compatible source. Now onto the app. So the volume control dominates the majority of the home screen. 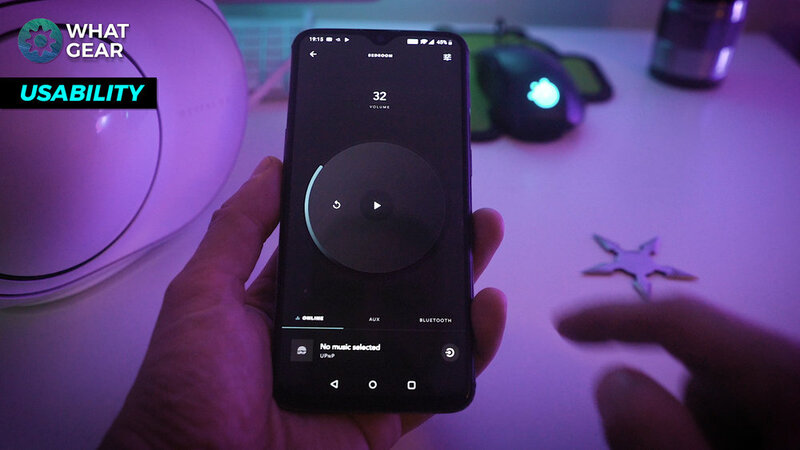 With the volume dial. All the options to switch sources are there. Due to the fact, I use an Android phone. To get the most out of the phantom wirelessly you will need to download the Bubble UPNP app. It kind of works in tandem with the Devialet app. Would be nice to see this integrated into the Devialet app...but to be honest once you set it up it works pretty seamlessly. So that brings me on nicely to the Quality. When it came to testing the sound quality. You know I wasn’t going to be testing this epic HiFi compact speaker with some horribly compressed source. So I went out of my way to download some HiRes Flac tracks , especially for you guys. It is important you understand, that what you are hearing in the video is recorded via a video rode mic pro. Then rendered in premiere pro. Then played back on the device your watching on... So the Phantom Reactor really is something you have to go to the store and hear and see for yourself. Click on this image above to watch the Devialet Phantom Reactor sound test segment of the video. I really did try my best to visualize the sound quality in the demo video. I hope you can appreciate that. I've heard a lot of Hi-End speakers... I actually worked in the Harrods technology department...you know that dusty old building in London Knightsbridge for a long time. I've heard a lot of end stuff. Hopefully you can trust my opinion more than most. The great thing about the sound quality is even at lower volumes you still get that full sounds. When it comes to the sound stage it's not fair to judge it without listening to a stereo pair. Just know this. In my opinion a single Phantom Reactor packs more than enough power to fill a large room with powerful bass and amazing clarity and smooth mids. The best thing about the Reactors sound quality is that even at its highest output level there is no sharpness to the highs. Nothing is lost in the mids or bass notes. It is incomparable to anything you will find on a speaker this small. I can promise you that. And I don't even need to tell you about the build quality... Because you already know. Devialet has its own patented amplification tech. The ADH which is essentially combining class A and Class D methods. The advantage of this is that the size of the amp can be much smaller. You get the raw power of an analog amplifier combined with the efficiency of a digital amp. So to break it down simply you can blast this thing from zero to 100 in second and suffer no distortion, 0 saturation, and zero background noise. Just a clean room-filling audio track at whatever level your listening at. It's amazing that even at low volume you still get a really full rich sound. Next up the heart bass Implosion tech. Did you know the cabinet of this speaker has been sealed with 500KG of pressure? So all that pressure just wants to explode out of this thing with those bass notes...and hopefully, you could really see that in the sound test section. Signal active matching... So basically Devialet says the phantom will match the exact rhythm and tempo of your music with absolute precision. So the idea is the way in which the phantom outputs the sounds from either side and from the front. You get this real waveform coming from the speaker. Sort of like the pattern you would see if dropped a pebble into still water. That sort of smooth ripple effect. And the last awesome Feature has got to be those woofer covers. What other HiFi speaker is there out that is visually pleasing as this. Yes, there are lots of cheaper options out their...but that's not what you're looking if you are watching this. The Devialet Phantom is head and shoulders above anything else of comparable size. That's why it costs so much. If I had space I would probably opt for the bigger phantoms. That statement comes from real life experience because I actually had a gold phantom here, and I quite literally couldn't find anywhere to put it. The Phantom Reactor is so compact and fits perfectly in any room in my apartment. My dream setup would be to have two phantom Reactors either side my TV on the official Devialet ...stands. That would quite literally be the perfect setup for me. The Phantom Reactor is the best in class when it comes sound to size ratio. Yes, you could get more bass and more mids from the Devialet Gold Phantom but damn they take up a lot of space. But not as much as a floor standing speaker. So should you buy the Phantom Reactor? Yes if you are after the best quality compact speaker on the market. If it's the power you're after then check out this video you will like it. See you in the next one. Don't be late. Check it out! One year later I finally get my hands on maybe the FINEST wireless speaker known to man! Watch #WhatGear shootouts : https://youtu.be/x9oYZCs9vGg It's the WhatGear Devialet Gold Phantom review. The Gold Phantom has 4500watts of power...Is it a sound investment? Check the price : https://amzn.to/2GJ9kG2 This is a GROUND breaking bit of kit from a french company. Engineered to perfection. This really takes wireless speakers to a whole new level. If you get a chance to actually hear one of these I'm pretty sure you won't regret it.